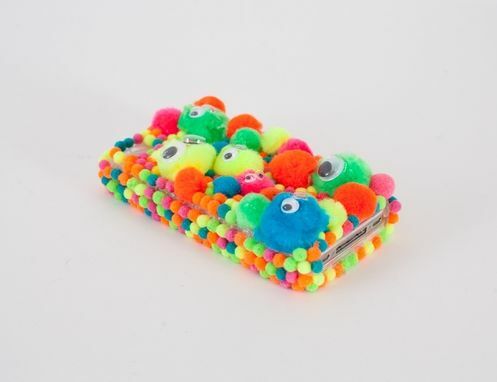 This pom pom iPhone case is decorated with multi-sized pom poms ranging from 5 mm to 25 mm big. They are securely glued to the back, sides, and front lip. The back of the case has pairs of googly eyes attached, giving the case some furry creatures! The case comes as a 2 piece attachment which snaps together. The camera eye, volume buttons, headphone jack, and USB connection are all left unobtruded.